TONY DODSON has questioned the acclaimed punching power of Ovill McKenzie – as he vows to mercilessly rip the Commonwealth title away from the Derby man. The ‘Garston Warrior’ yesterday secured his shot at the light-heavyweight crown with the bout taking place on February, 3 in Manchester. Dodson, 31, is looking to add a 12 stone seven pounds title to his IBO International belt and believes he will expose the champion as a “glorified journeyman”. 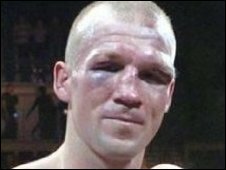 McKenzie’s unflattering 19-11 professional record belies a man with a sizeable dig as last opponent Jeff Evans – brutally knocked out in just 15 seconds – will testify. World title challenger Tony Bellew has also tasted the venom in McKenzie’s right hand, twice hitting the deck in their December 2010 Commonwealth title scrap at the ECHO Arena before climbing to his feet to halt the ‘Upsetter’ in the eighth round. Dodson insists the shots which caught Bellew were fortunate and that McKenzie’s eight stoppage wins do not stand up to close scrutiny. “When you look down his record he has only knocked out kids,” said Dodson (28-6-1). “He has beaten people who are not at a good level and when you are fighting domestically at a lower level, of course your punch is going to be harder. “But when he steps up in class and calibre – to the level I’m at – then his punches are not going to be as hard. “His last opponent looked like a rabbit caught in the headlights. “I will beat McKenzie in every way, shape and form. “My speed and overall boxing ability will beat him. “I’ve fought better fighters than Ovill McKenzie. “He gets recognition because he took Tony Bellew the distance and caught him with a lucky shot in their first fight. “But Tony got back up and stopped him. Dodson, who was teeing up an English title chance against Bob Ajisafe before the McKenzie offer was tabled, has taken some advice from Bellew but insists he must approach the fight in his own way. “Tony has given me little bits of advice but let’s not forget, I’m a 35 fight professional who knows the game and knows what needs to be done to get this win,” he said. “This is my time now, this is what I should’ve achieved a long time ago. I’ve been here before but have never performed. With just over five weeks to go before he clashes with McKenzie at the Bowler’s Arena, Dodson was satisfied with his weight, which was a stone over the limit when he spoke to the ECHO yesterday. Refusing to relax too much following October’s IBO title victory over Darren Stubbs, the 31-year-old says he completed 15 rounds on the pads with comfort and is already itching to be unleashed on the Derby man. “Luckily I’ve kept trim since the last fight and have only got to drop a stone, which is a godsend for me. “I did 15 rounds on the pads yesterday and I did it easy. “Boxing changes every five minutes and especially with the way things are at the minute, everyone is looking for work. You have to stay in the gym. “I’ve got Martin Murray in the gym for sparring but I’ve never been big on sparring.